just the plain hassle of getting started? If you’re nodding your head to any of the above, we’ve got something really cool for you to consider. It’s something that addresses all of those issues. It’s designed from the ground up specifically for the family — not the individual, not the teen, but parents and kids working together as a collaborative unit on good money habits. 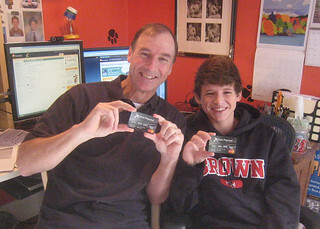 It’s the FamZoo Family Pack of prepaid cards. We developed it with our partner TransCard, and it integrates seamlessly with your existing FamZoo virtual family bank. NOTE: See our recent Family Pack coverage in TIME by veteran personal finance journalist and author, Dan Kadlec. The family pack consists of “funding cards” that belong to one or more parents and “dependant cards” that are associated with one or more children. Kids may optionally have multiple cards for different categories of spending, or for building up savings, or for making charitable donations. The cards in a given family pack are linked together by a common group identifier — a novel new (patent pending) concept that has been integrated deep within the TransCard prepaid technology platform. 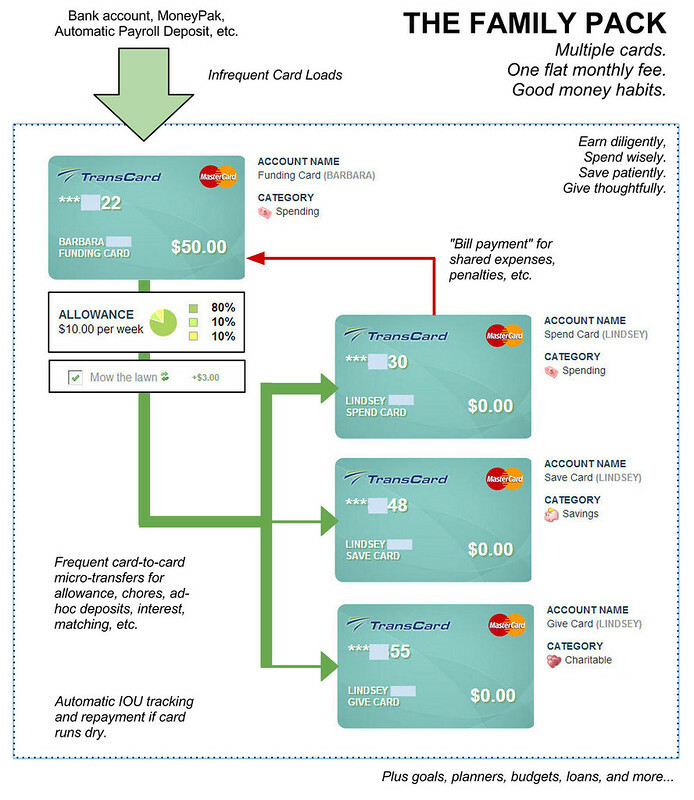 When using a family pack, parents periodically load up their funding card(s) from an external source with relatively large sums through a variety of card load options ranging from GreenDot’s Reload @ the Register to automatic payroll deposit to online transfer from a partner bank account. These funding card loads may or may not incur fees depending on the arrangement or partner, but the intention is for these loads to be very infrequent relative to the parent funding of the child cards. Money flows from the parent to the child cards though frequent “micro” payments and incentives defined and controlled by the parent. Examples include a scheduled allowance payment, a savings interest payment, a matching contribution, payment for a completed chore or odd job, a reimbursement, an ad hoc transfer, etc. These frequent micro-payments flow from parent card to child card within the same family pack via card-to-card transfers with no fees. Money can also flow without fees back to the parent from the child. Examples include “bill payment” for the child’s portion of a shared family expense (for example, the child’s portion of a cell phone data plan) or even penalty assessments by the parent (for example, a $1 fine for not completing an expected chore or a penalty for going into debt with the parent after a scheduled “bill payment”). The prepaid card accounts are seamlessly integrated with FamZoo’s existing IOU accounts (also patent pending). Each child’s prepaid card account has a corresponding builtin IOU account. If the parent funding card has insufficient funds to make a micropayment (like for a recurring allowance payment), the shortfall is automatically recorded in the associated IOU account as a debt owed by the parent to the child. When the parent ultimately loads more funds on to the funding card, any IOUs to the children are automatically repaid. Conversely, if a debt is owed by a child to the parent, subsequent parent payments go toward paying off the child’s outstanding IOUs first before any additional money flows to the child card. The family pack product is a superset of FamZoo’s existing Virtual Family Bank offering. It includes support for standalone IOU accounts for younger kids (independent of prepaid card accounts), interactive educational personal finance tools for budgeting and goal tracking, and mobile access via iPhone/Droid or text messaging. What about fees? Teen prepaid cards tend to get a bad wrap in this department with youngsters inadvertently racking up charges for seemingly benign actions like balance inquiries and ATM transactions. Not so with the family pack. Parents hate those unpredictable fees, so we’ll be offering the family pack for one flat monthly fee. No “hidden” usage fees for your child to unwittingly rack up. Nada. None. Zippo. The only additional fee you might encounter would be for periodically loading up the parent funding card as described above — but that’s up to you because there are free options like Dwolla available too. So how much is that flat monthly fee per family? We’re not completely sure yet for the long run, but here’s a super sweet introductory deal for our first 1,000 families only. If you are (or become) a paying subscriber of FamZoo, we’ll throw in the family pack (first 1,000 families only) for no extra charge beyond our regular subscription fees which currently range from $5.99 per family if you pay month-to-month all the way down to the equivalent of $2.50 per month per family if you prepay for two years in advance. That’s an absurdly awesome deal — no doubt about it. The usage patterns of our first 1,000 family pack families will allow us to determine a viable flat monthly fee to charge for subsequent subscribers going forward, which will undoubtedly be higher. Note: we reserve the right to terminate this introductory offer at any time, even prior to reaching the 1,000 family mark if we deem appropriate. How do you get your family in on this deal? Just contact us and let us know you’re interested in reserving a spot as one of the first 1,000 family pack families. We’ll add you to our list. By the way, it’s OK to change your mind later and you don’t have to be a current FamZoo subscriber to reserve a spot, so if you have any interest whatsoever, you should stick your name on the list now. When will the family packs be available? Any month now. We’re applying the finishing touches as we thoroughly road test the cards in the real world with the families of FamZoo and TransCard employees. You can take a peek at some of my early experiences with my son here. We’ll notify the first 1,000 families on our list as soon as we’re ready to go. Hi Kathryn, I'd say it's as easy or as hard as you want to make it. Some parents set up a very simple system with a single card for the child and very simple money rules (if any). Others get very elaborate right off the bat. Most start out simple and add more cards/rules gradually as the kids mature and can handle more sophisticated financial concepts. Instilling good money habits in kids over time definitely takes some effort, but one thing is for sure: things get REALLY hard for kids and parents alike if you don't take the time to teach them about personal finance. Our goal is to make that educational process simpler for families by thoughtfully applying technology and automation.